Yup, to make up for my lack of frequent posts, I thought I better make this post big. 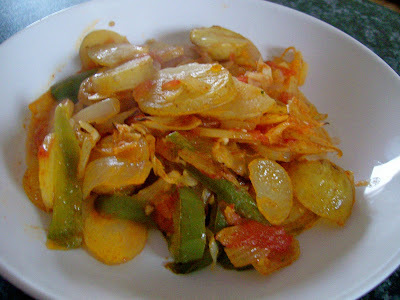 I have been cooking and taking pictures of everything, I just haven't gotten around to blogging. Anyway, this is another one from Alternative Vegan. 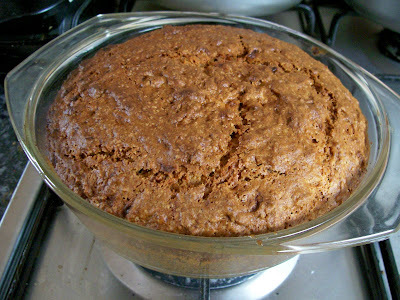 It's banana bread, and it was delicious. Have I mentioned how much I love living next to a huge oriental supermarket? If not, I do. It's even open on a Sunday, so I popped in there and got some abura age (tofu pouches) and stuffed them with some sushi rice. It was loosely based on the recipe from Japanese Cooking. They were really delicious and the rice stayed inside the pouches really well. The dipping sauce is Teriyaki. 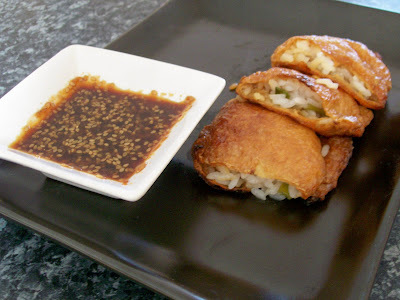 The next night we had something else from Japanese Cooking, the Crispy Fried Tempeh. 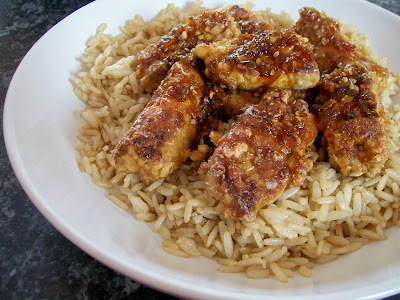 It's basically tempeh marinated in soy sauce, mirin etc and then dredged in some flour and fried. I served it with wholegrain rice and topped it off with a little teriyaki sauce. I'm totally digging the teriyaki sauce these days. To be honest, I found this meal a little bit on the salty side, but Gary loved it so, meh. Next up we have the Hungarian Potato Paprikash from Please Don't Feed The Bears. It's basically a whole load of vegetables chucked in a pot. I baked it in the oven for a while too, to let the potatoes crisp up a bit. 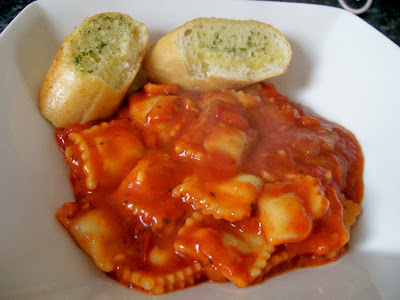 Its was really tasty and comforting. The next night we stuck with Please Don't Feed The Bears and made the Taco Thrasherole. It was kinda like a chilli casserole. 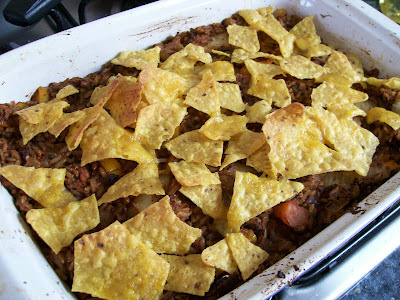 There are more tortilla chips on the bottom. I thought it was great, but Gary thought it was too spicy, but he is a spice wimp. This is something we had for lunch during the week. 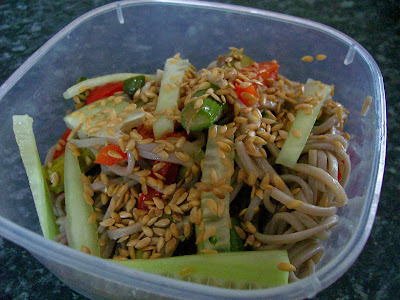 It's a soba noodle salad from Japanese Cooking. It was good, but we both found it far too oily. Finally, we have a bit of a product review. 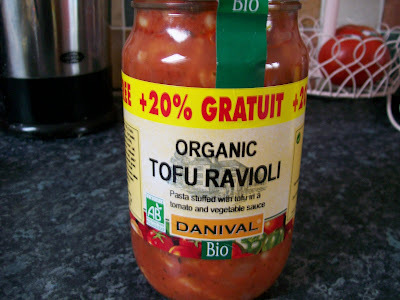 I'd seen this tofu ravioli before, but it was really expensive and I couldn't bring myself to buy it in case we didn't like it. So when I saw it 20% Gratuit, I snapped it up! Here it is cooked. We really enjoyed it! The tofu filling could have been a little more flavoursome, but it's fine for a cupboard standby when you can't be bothered cooking. That's all! I've started planning my meals on a Sunday. As sad as it sounds, it saves us money if we buy all the food at once, instead of nipping to the shops for this or that. It also saves a lot of hassle, and if I have something written down I will actually make it, instead of eating rubbish! I've had Dino Sarma's cookbook Alternative Vegan on preorder for quite some time now, so it was a nice surprise to come home from work last week and have a lovely present waiting for me! If you haven't heard of Dino Sarma, where have you been? He does regular cooking segments on Vegan Freak Radio, and is a prolific member of the forums. Enough of the adoration, and onto the food! This is the Venn Pongal. 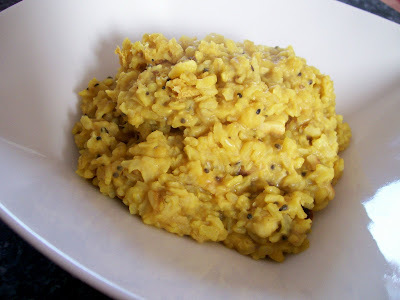 It's a delicious mix of rice, moong daal, cashews, spices, and I can't remember what else. It was really nice, comforting food. Unfortunately I couldn't find curry leaves anywhere, which was an ingredient, so I just went without. I'll have to have a good look around the shops next time I get a chance. It's been weirdly hot here the past few days, but that's Scotland for you, we get all the seasons, all the time, mainly cold, but meh. 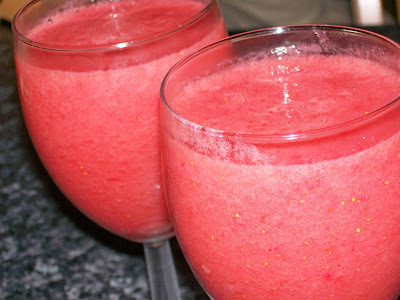 Anyhoo, yes it was hot, so I decided the next thing I was going to make would be his Pomegranate Wine Slushies. These were also delicious. So refreshing! As well as the obvious pomegranate juice, wine, and ice, there's also strawberries and some lovely seasonings. Sounds delicious, doesn't it? It was. Lelly is a bad blogger! It's true. The only excuse I have is that I don't get home from work till late so Gary has been cooking quite a lot and we've been forgetting to take pictures. I truly am rubbish. You know sometimes you just want to eat some comforting stodge even though it's June? Today was one of those days. To be fair though, it's not like it's warm in Scotland, it's been bloody freezing the past few days. Anyhoo, here is said comforting stodge. 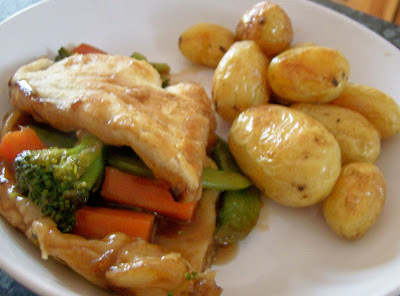 It's vegetable pie and potatoes. Can you really get a stodgier meal? No, didn't think so. Okay now, remember the giant monkey balloon in my last post? Well it had been gone for a while, and then we went out on Saturday and it was back! 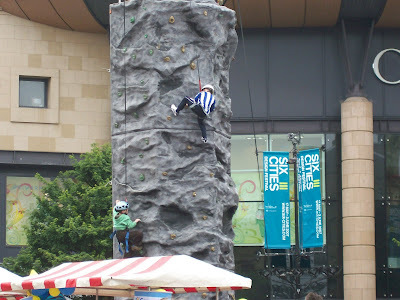 Even more surreal was the fact that a huge climbing wall had been erected at practically the end of our street (if I haven't mentioned it before, we live right in the centre of town, near all the craziness). Again, I decided that photographic evidence was required to stop us thinking we were going mad.